Thirteen of the new stations are in Metro Vancouver. BC Hydro is expanding its network of electric vehicle charging stations. The Crown utility says 28 new stations complete the second phase of its fast-charging network and are in addition to the 30 stations opened in 2016. Thirteen of the stations are in Metro Vancouver, seven are on Vancouver Island, including one at the Pacific Rim Visitor Centre near Tofino, another is in Campbell River, and two have opened on the Coquihalla Highway at the Britton Creek rest area. A further six stations are located throughout the East Kootenay and BC Hydro says the next phase of its program will connect drivers travelling between Kamloops and Prince George, while stations in Prince Rupert are also being planned. Hydro spokeswoman Mora Scott says the stations can charge an electric vehicle to 80 per cent in just 30 minutes, at a cost of 35 cents per kilowatt hour. Mora Scott says that translates to roughly $3.50 for the equivalent of a full tank of gas in the average four-cylinder car. "The number of electric vehicles on B.C. roads is increasing, there's currently around 9,000 across the province, and we actually expect that number to rise to 300,000 by 2030," Scott says in a news release. 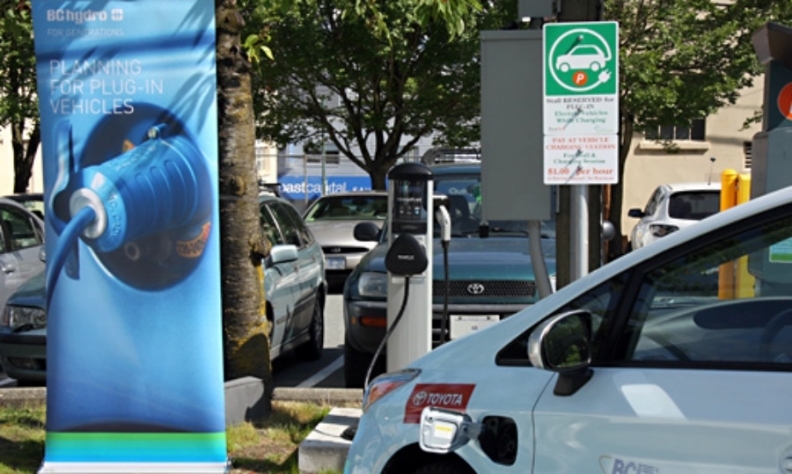 In partnership with municipalities, regional districts and several businesses, BC Hydro has been installing charging stations throughout the province since 2012 with support from the provincial and federal governments. Scott says the utility wants to ensure the stations are placed where drivers need them so charging options are available provincewide. "One big thing that we know drivers of electric vehicles worry about is the concept called range anxiety, that the stations aren't going to be where they need them," she says. Several models of electric vehicle are now capable of travelling up to 500 kilometres on a single charge, says Scott. Hydro president Chris O'Riley says the new charging sites will encourage electric vehicle drivers to explore B.C. this summer.